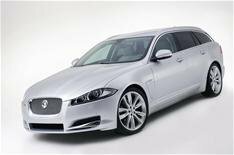 2013 Jaguar XF Sportbrake preview | What Car? The Jaguar XF Sportbrake is only the second estate car in Jaguar's history, and were offering the opportunity to see it an exclusive early preview. Taking its front end directly from its saloon sibling, this elegant estate could be the practical answer that space-craving XF fans have been seeking. A6 Avant, BMW 5 Series Touring and Mercedes-Benz E-Class Estate and want to see how it measures up, we want to hear from you.